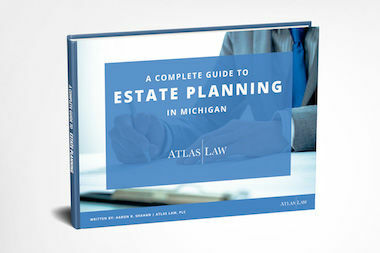 Free estate planning resources to help you complete your estate plan! Learn about important documents including wills, trusts, ladybird deeds, medical powers of attorney, financial powers of attorney, and much more. The book also address unique circumstances such as estate planning for second marriages and singles. It also shows techniques to protect you family—including minor children. Lastly, learn how to get started on your estate plan today and how to keep it up to date. Download your copy for free now! Everyone should have an estate plan. However, determining which type of estate plan is right for you can be difficult. Wills and living trusts are often the foundation of most estate plans. Each is a separate legal tool with its own set of advantages and disadvantages. While most people understand the purpose of having a will or living trust they often do not know the subtle differences between the documents. To understand the difference between a traditional will and a Living trust, you must first understand the basics of each. 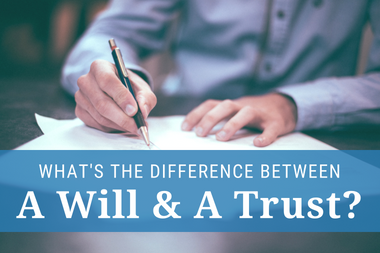 So what is the difference between a will and a trust? Estate planning is a term that has changed dramatically over the years. At one time, estate planning meant having a will that would go through probate and, if a person was married, ensuring that your property was titled jointly with their spouse. Today, estate planning is more multifaceted. 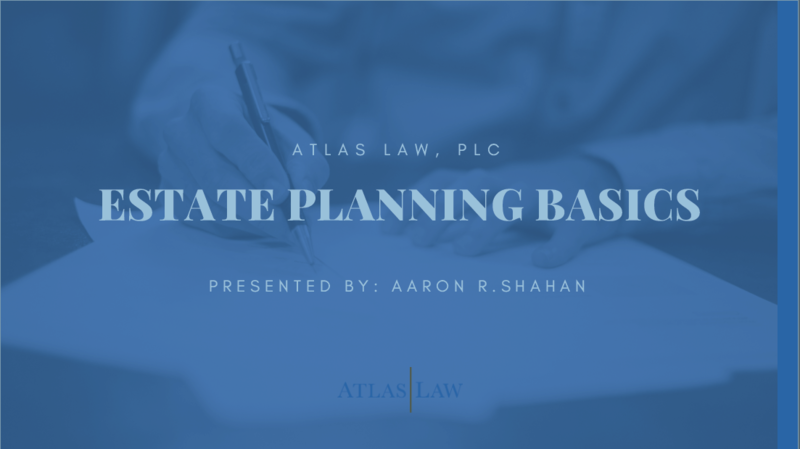 At Atlas Law, PLC, our estate planning attorney is ready to assist you in developing an estate plan tailored to your specific needs. Here is a power point presentation explaining the basics of estate planning. Dealing with the death of a loved one can be an overwhelming and emotional experience. From making funeral arrangements, closing accounts, consolidating debts, securing property, opening a probate, to the more obscure tasks of cancelling voter registration cards and subscriptions, it can be difficult to balance the broad range of responsibilities. 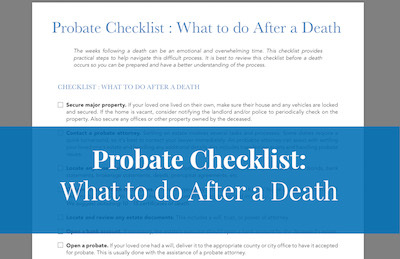 In an effort to alleviate some of the confusion and help you navigate this difficult time, we created a checklist of what to do following the death of a loved one. Estate Planning Checklist. Does Your Plan Need Updated? By creating an estate plan, you have already taken the first step to protect yourself and your family. It is crucial, however, to ensure that your estate plan is kept up to date and functions properly. Take a look at the list of important events below to see if it is time to revise your will or trust. 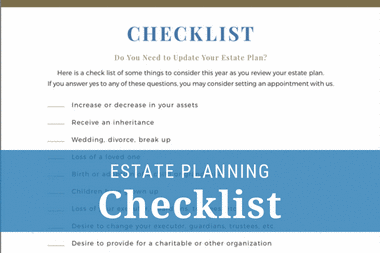 Here is a checklist of a few things to consider this year as you review your estate plan. If you answer yes to any of these questions, then it is time to set up your free consultation with us today. Estate Planning Checklist. Do I Need an Estate Plan? Determining whether or not you need an estate plan is often the first step in the estate planning process. 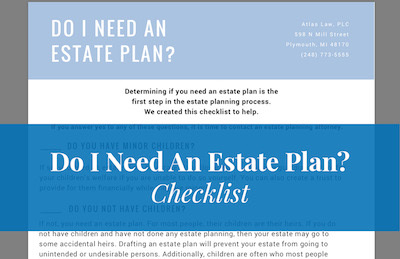 Atlas Law, PLC has created this checklist to help you decide if it’s time for you to create an estate plan. Take a look at the checklist. It includes many of the most popular reasons you may need an estate plan. If you answer yes to any of the questions on the checklist, then it may be time to contact an estate planning attorney. Download the checklist for free now! You can find a patient advocate form or medical power of attorney form online, or for purchase at your local office supply store. Be extremely cautious when using these forms as they are typically not state specific. Therefore, they may not be ideal for Michigan residents. Moreover, they often to not take into religious considerations. 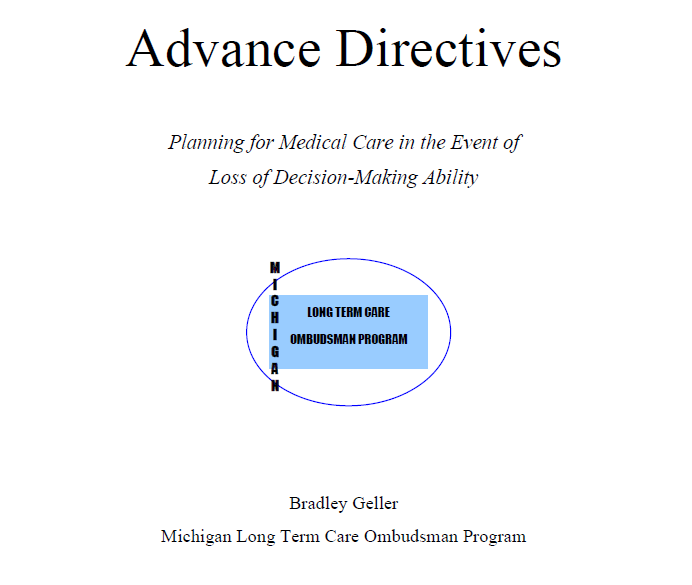 If you would like a free patient advocate form, consider using this advanced directive form provided by the State of Michigan . Please also consider executing a HIPAA release authorizing your patient advocate to access your medical records. A HIPAA release is not included with the State of Michigan Forms. Our office is located in Plymouth, Michigan. Our Plymouth attorneys serve all of Southeastern Michigan and Ann Arbor, including Plymouth, Canton, Northville, Novi, Farmington, and Northville. We offer exceptional legal services in the areas of Elder Law, Estate Planning, Trusts, Probate, Will and Trust Administration, Private Foundations, Charitable Trusts, Lady Bird Deeds, and Special Needs Trusts.